What is SFI's line-up for 2015 again? Is it finalized? @RohanMehta: Not quite yet. Perez keeps saying he's close to a new deal, though. Raikkonen's session is over - looks like his Ferrari was suffering a power loss. 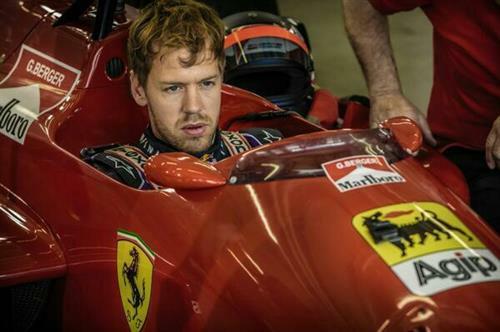 More woe for Ferrari, who knows he may be getting a new team-mate in 2015. @Willie: Seventeen minutes to go now. Vettel is out of his RB10 and removing his helmet, as Red Bull do a bit of work on the car. We'll have a bit of a lull before the drivers embark on some late runs on the medium compound tyre. What happened to the 3 drivers/team speculations? @SahilShah: Discussions about that are still ongoing but it all hinges on whether smaller teams fold. where will vergne go now? @eza: Possibly Sauber, that's one rumour I heard in Singapore. But his options look severely limited at the moment. Turns out that earlier run from Vergne was. in fact, on mediums. Nobody cares now but SFI is in deep trouble this weekend, Their aero upgrade sent them backwards ? Ha.. Both Ferrari 2015 drivers out of the session, and it is only them in their respective current teams to be affected by reliability.. What a coincidence..
Ah Caterham. Remember them? Every other bit of F1 news has paled into insignificance now, hasn't it? Ricciardo, Rosberg and Alonso all out on the mediums. Ricciardo is now the undisputed main man'at Red Bull. Let's see how he steps up to the plate - though you could argue he already has this season. Don't think I've ever seen a media centre pay less attention to a practice session. I don't think I've ever paid less attention to a practice session, either. I think Caterham and Marussia ought to be forced to give it up. Year after year, race after race no development. Ricciardo's first lap on the options looks scruffy through the Esses - he goes fourth. Rosberg lights up all three sectors, lowering the benchmark to a very impressive 1:33.228. Hamilton about to start his own hot lap so let's see how they compare. Clear to see it's another straight fight between the Mercedes drivers for pole. Has anyone interviewed Alonso since the big Vettel news? @LongBeach78: No. He has a media session after this session. HAMILTON GOES STRAIGHT ON AT THE CORNER! First corner, even. That has damaged his Mercedes and that could have a huge impact on qualifying this afternoon! Looks like Hamilton just carried a bit too much speed into the corner as he started his flying lap. Bit of understeer and you can see him desperately trying to slow the car down. Mercedes now faces a race against time to fix his car. Did he hit the barriers?